To make a perfect wood product, the workers must have spent a hard time to complete it. Each of wood product will have their own shapes. Therefore, they have to carry out every different step with every different tool which will be supportive or suitable for its step. One of its most important steps is routing the wood product which makes it smoother and lighter. However, it will not be easy for people to use this tool – wood router. So, in this article, I will show you the ways how to use a wood router safely. Before starting to make a wood product with the wood router tool, you should get its definition, as well as its composition clearly. The router is a tool which is usually used to hollow out the surface of hard area, especially wood product. In the recent market, it provide many form of wood routers such as hand tool form of router, power tool form of router… In spite of the fact that the hand tool has more advantages than the power tool, most worker like the versatility of power tool due to being replaced by the modern spindle router. One of the most important factors in wood router is router bits which have many of varieties. Its main function is that create many differently decorative effects of wood products. Therefore, they are also designed many difference types to be able to make the artistic lines of wood pieces. Combining wood router with its bits is not easy for worker, so you should pay attentions to some mistakes which you often make. 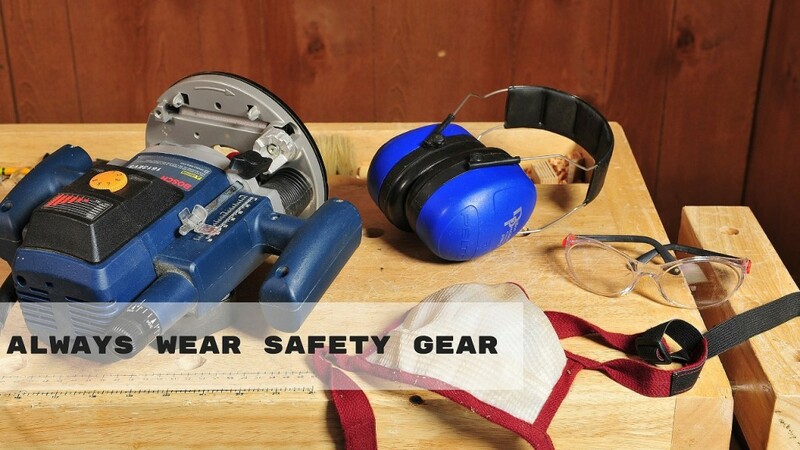 Prepare some safe gear to wear during routing: it help you protect your eyes, ear… In case, someone has a long hair, you should prepare a hat to wear before starting your work. In the process of routing, the sound from wood router is quite louder. Therefore, the worker often use proper eye, ear and mask which can prevent from dust to wear in every single working time. One more safe demand to starting to rout is that you do not wear the loose clothes because it will be easy to hit against this tool. Keep the stock or the wood piece in secure position: Based on the size of wood piece, you can choose the difference sizes table to put it. It will make the position of wood strip more steadily. Try to keep your hand and fingers safely: whenever you route a wood piece with free hand, you should notice that you never use like that, instead, you should use a push block, push stick, feather board due to its flexible propellant. It not only protects your hand and finger but also makes the cut’s wood piece more and more qualitative. Don’t do any adjustment without unplugging the router at first: you should switch off router of switches, even don’t connect the power with whatever the bits are changed. Always make sure that all of its tool or attachments are completely prepared or tightened safely before contacting with power. Install the router bits correctly: At first, you must choose an exact bit which will be suitable for the form of router you wish to use. Remember that never install the router bits contacting with the bottom of the collet because it will be easy to lead to loosen while routing. That seem such a dangerous case. You should also put bits in collet tightly. Just in reasonable limit. Take light cuts: The cut of different wood areas will create kickback. Therefore, after use this bit to rout that wood area, if necessary, you can replace the other one to use it in the other area well. Don’t use your own strength more: the best way here is that you should the power of wood router more than your power. Don’t turn upside down the stock of router: the main reason is that it can catch the wood and break it down anytime. Maybe you search some information about this tool on some websites. However, I find it long or difficult to read and understand. These are some basic knowledge about the wood router. Just do every single step, but you should remember to notice the tips I have showed above. This seems your own manual. Let’s read the manual carefully before starting your work. The above tips I have mentioned can be useful for you during routing. Hope that you will use the wood router successfully and never make any mistakes thanks to these tips. Keep calm and be ready for doing it.